The core of USB has remained much the same since the release of USB 1.0 in 1996. But the interface has expanded to support faster bus speeds, improved power delivery and management, more device classes, wireless communications, support for embedded systems that access USB devices, and more. New and improved chips and development tools have eased the task of developing devices and the software to access them. This Fifth Edition is revised and updated throughout. New topics include an introduction to USB 3.1 and SuperSpeedPlus, enhanced power delivery and power management, new abilities using USB Type-C connectors, designing devices that use the WinUSB driver without requiring a vendor-provided INF file, new device classes, and how to use free debugging tools. Much of the information in this book applies to any device hardware and host computer. The example code for applications uses Visual C#. One of a hub’s duties is to detect attachment and removal of devices on its downstream-facing ports. Each hub has an interrupt IN endpoint for reporting these events to the host. On system boot-up, hubs inform the host if any devices are attached including additional downstream hubs and any devices attached to those hubs. After boot-up, a host continues to poll periodically (USB 2.0) or receives ERDY TPs (Enhanced SuperSpeed) that request communications to learn of any newly attached or removed devices. My USB Central page has the latest versions of applications and firmware using the example code in the book, plus links to chip and other product information and much more. DevMonkey's Jon Titus recommended USB Complete and USB Embedded Hosts. USB 2.0's 650-page specification...is nothing if not ambitious. However, just how much useful information any mortal who wasn't involved in writing this tome can actually glean from it without going insane is a different matter. EEs who are interested in a clearer, more concise presentation might do better to obtain a copy of USB Complete, Second Edition. - Dan Strassberg, EDN. An excellent and highly recommended how-to guide and reference. - Midwest Book Review. I know I could build the interface myself with the information provided in the two seminal books on the subject: USB Design by Example by John Hyde and Jan Axelson's USB Complete. - Bill Machrone, PC Magazine. For a very detailed discussion of USB and how to develop custom USB peripherals, check out USB Complete by Jan Axelson. - TJ Byers, Electronics Q&A, Nuts & Volts. A great job of presenting the difficult topic of USB peripheral development. - Karl W. Pfalzer, Book Review of the Week, www.enterprise-zone.com. The author has a flair for taking complicated information and making it readable, interesting, and informative. This is the best book on the topic. I recommend it highly. - Jon Titus, Test & Measurement World. Jan Axelson has done it again. The subtitle of this book is Everything You Need to Develop Custom USB Peripherals, and the book lives up to its billing. If you want to add the Universal Serial Bus (USB) to your repertoire, then this is the book for you. - Joseph J. Carr, Nuts & Volts. A readable and comprehensive book that covers all aspects of actually building and coding USB devices. Jan's description of building a HID-class peripheral is the best around. - Jack Ganssle, Embedded Systems Programming. This is the best, clearest, single source of USB information I've yet seen published. It's unusual to find such an easy-to-read style combined with real meat. - Lane Hauck, Member of the Technical Staff, Cypress Semiconductor. I tell all my students that they really need this book in their library. - Paul E. Berg, instructor, Annabooks USB Developers Workshop. Many books are full of things that are easy to find out, and skirt around the harder stuff, which you have to really work at. What I really like about this book is that Jan has obviously slogged at the difficult stuff as well. - Dave Wright, Applications Engineer, Cypress Semiconductor. USB Complete provides a great groundwork for anyone working with USB for any purpose, whether it is designing a peripheral or creating host software. This book should be read by anybody getting started with USB. - Joshua Buergel, BSQUARE. USB Complete was selected for Intel Corporation's Recommended Reading List. USB Complete was a nominee in Books24x7's third annual Referenceware Excellence Awards. USB Complete won an Excellence Award in the Technical Communication competition of the Society for Technical Communications, Twin Cities chapter. 524 pages, 7x 9 in. USB Complete Fourth Edition (ISBN 978-1931448-08-6, 2009). Corrections. 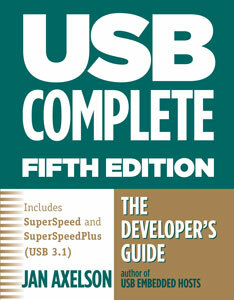 USB Complete Third Edition (ISBN 1931448027, 2005). Corrections. USB Complete Second Edition (ISBN 0965081958, 2001). Corrections. USB Complete (ISBN 0965081931, 1999). Corrections.